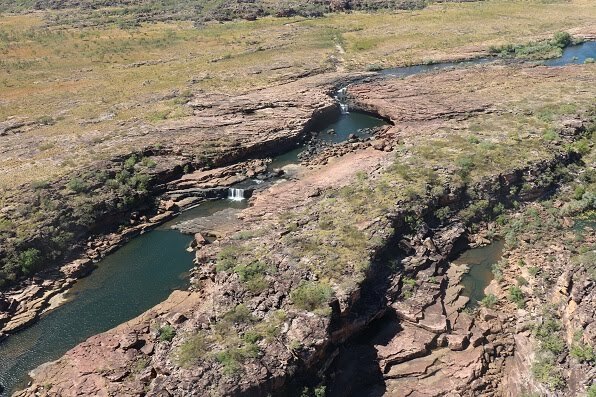 Michael Osborne takes a helicopter ride into the unspoiled wilderness of the Kimberley Coast. 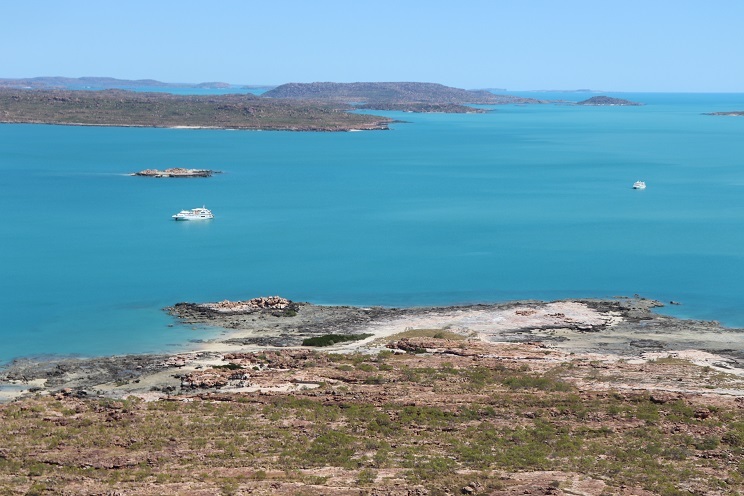 Recently I had the chance to sail on a Coral Expeditions ship as a guest of Christian Fellowship Tours, sailing from Darwin to Broome along one of the most wondrous coastlines in the world. It was a cruise I enjoyed eleven years ago and one that I have been waiting since then to go experience once again. The Kimberley is a huge and rugged region that has been inhabited by indigenous people for many thousands of years. The area is tropical and that defines the landscape which is astonishingly beautiful and virtually inaccessible by road. It covers an expanse of more than 420,000 square kilometres (around three times the size of England) with only about 33,000 people. The only way to get a true impression is from the air, as there aren't many roads in this remote place. One of the many highlights of my original visit was the chance to fly in an open-door chopper as we filmed Mitchell Falls and the Kimberley Coast for a TV show. 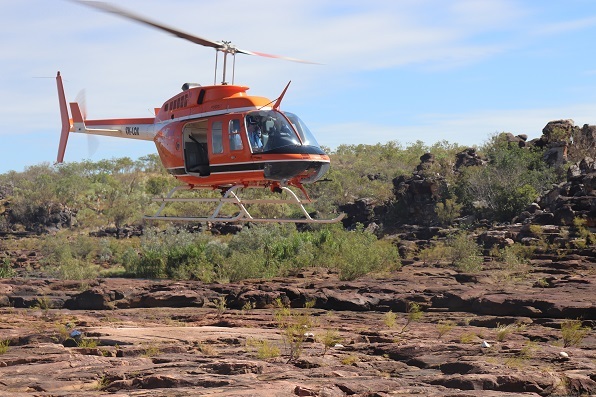 Coral Expeditions offer an optional helicopter flight through the local charter company HeliSpirit, who, amongst other services, arrange very special scenic flights over the wilderness, including Mitchell Falls. Having done this before, I was able to explain to some of the other 40 passengers that this can be the scenic flight of a lifetime. 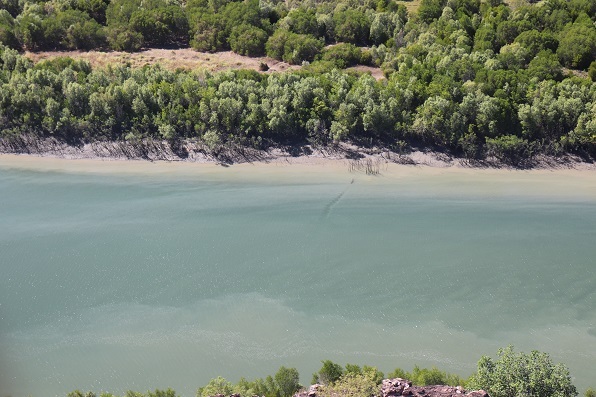 It is a unique chance to experience not only a helicopter ride (many had never flown in one before), but to photograph this very special part of Australia from the air and the ground. Our ship, Coral Explorer I arrived at Winyalkin Bay on a beautiful clear morning and after breakfast, we heard the sound of the approaching helicopters, which landed on the beach as the excited passengers were transferred ashore via our tender. Our pilot introduced himself and explained all the safety requirements and then made sure we were all securely strapped in. I checked my seatbelt at least three times because I was sitting next to the open space, the doors were taken off to allow for photography! The sensation of lifting-off is a thrill I hope I never get tired of. Within seconds we had awe inspiring views across the bay and our ship was floating on some of the bluest sea you could imagine. As we flew inland along the Mitchell River our pilot kept up a very informative travel guide through our headphones. 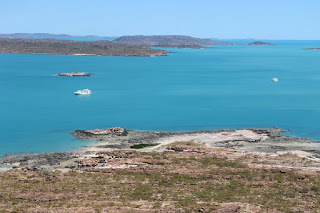 We saw some very large saltwater crocodiles amongst this amazing scenery. He took turns circling, for each side, so we could all get photos of the highlights. It only took around 20 minutes to get to the top of the escarpment and experience the astonishing views of the falls. After landing it was a guided walk around to the viewing areas and more photos. The ground was fairly rough, but members of the boat crew were there to assist if required. Being a fairly hot day, many chose to go for a swim in the large pools; no salties up here. 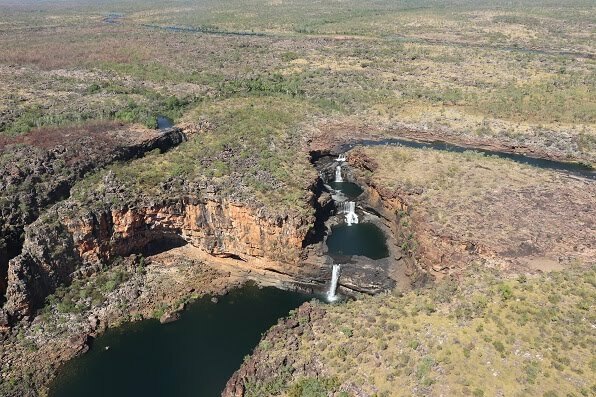 The four-tiered Mitchell Falls is iconic and one of the most spectacular waterfalls in Australia. 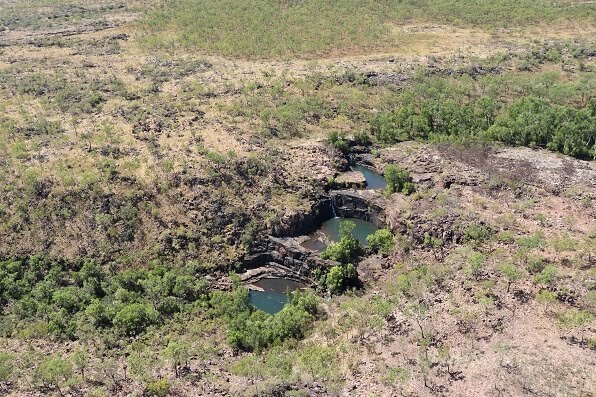 It is also known as Punamii-unpuu to the local Wunambal people. There were some attractions along the slightly different return route, including Little Mertens Falls and Mertens Gorge, before we saw the coastline. The country is so rugged, I wonder how did they ever cross this land on foot? As we approach the coast we saw that the flagship of Coral Expeditions, Coral Discoverer has arrived in the bay, making for another great picture. Some tips for when you go on this cruise:. Make sure you have some reef or wet shoes to wear for the beach landings. Have a spare battery and memory card for your camera. We took more than 5oo photos on the Mitchell Falls tour alone. A sensible hat and sun protection. A metal water bottle. There is beautiful desalinated water on the ship. My partner Pam and I were guests of Christian Fellowship Tours and HeliSpirit. 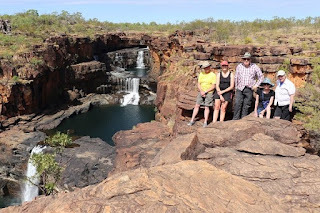 To contact Christian Fellowship Tours, who run amazing group tours around the world: www.christianfellowshiptours.com and 1300 635 358 in Australia.